Federation Personnel of Bolian species. Admiral. While this personnel is an eligible target for a random selection, you may discard a Paranoia card from hand to exclude him and an personnel present from that selection. "I want that record erased before anyone else can see it. Is that understood?" 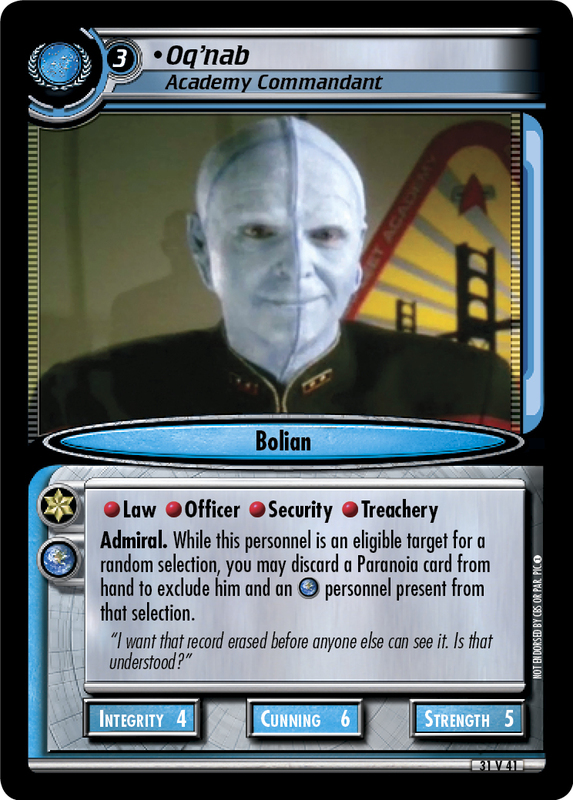 Characteristics: exclude personnel from random selections, affiliation, Earth related, discard a specific card from hand, Admiral, personnel who has a cost of 3 or more, Bolian species. Card logging info: First edited by Telak at Sep 9th, 2014. Please support openCards and validate game text of this card! Create your own Deck in the ST2E deck section!